For five years, give or take, Funko has been making a series of collectible vinyl figures called POP! The figures are based on comic books, television series, movies, comic strips, video games, even bands. There have been Beatles figures and Batman figures, Doctor Who figures and Star Wars figures, Frozen figures and Sesame Street figures. I’m not even scratching the surface. There are people in the office with massive collections of Funko’s POP! figures. Every week or so, there’s an announcement of a new license, and the frisson of excitement among my coworkers is palpable. I’ve never been bitten by the POP! collecting bug. Oh, there have been licenses that interested me — the Beatles, Arrested Development, Doctor Who — but my interest would go from “Oh, wow, look at that!” to “I don’t need that” in the span of about five minutes. Sesame Street was announced a few months ago, and there was a Mr. Snuffleupagus figure in the series. “Oh, wow!” And then, nothing. Peanuts was announced recently. I saw the pictures. “Look at that!” I said. And the feeling passed. I don’t need these. What would I do with them? I don’t have space for them. I don’t have space for the LEGO I have now, and I can do things with LEGO. The POP! figures, on the other hand, stand there and don’t do anything. The license I learned about today — which was apparently announced at Toy Fair back in February and are available for order now on Amazon — is Monty Python and the Holy Grail. I feel excited by these. I could see myself owning these, just as I could see myself owning the Sesame Street and Peanuts figures. There’s not enough Monty Python and the Holy Grail merchandise on the market. Maybe there should be a LEGO set or three. Maybe this film should be part of the LEGO Dimensions video game. I should mention, by the way, that I love Monty Python and the Holy Grail. No, I can’t quote it at any length. No, when I watch it I don’t often laugh at it; you’d think I was watching a serious drama if you were in the same room. But, I generally don’t laugh at Monty Python, at least not the television series. (I do, however, laugh at the absurdity of the comedy albums.) You’d think I didn’t like Monty Python at all, yet I genuinely find it hilarious and bonkers. Am I excited enough about POP! 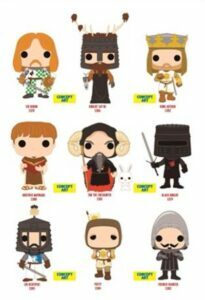 figures for Monty Python and the Holy Grail to buy them? I’ll have to think about it. I have been fooled on Holy Grail merchandise before; Monty Python’s Holy Grail Ale was an awful, awful beer. These figures are certain to be better than Holy Grail Ale, after all. It will probably depend on whether or not I have anyplace to put them. If all I do is buy them and box them up and put them away, then it’s not worth it to buy them; I’d only be wasting my money. Still, for people who collect POP! figures and like Monty Python and the Holy Grail, there’s undoubtedly fun to be had with this addition to the line. Oh wow, those are pretty cool. I am however a bit disappointed that there isn’t a Sir Galahad figure. Oh, well. Doesn’t appear to be a Lancelot figure either. I had to look at the line-up to make sure all six Pythons were represented. Lots of Cleese, a couple of Palin, and everyone else gets one. My guess — and it’s only a guess — is that Funko will eventually get all of the knights in a second wave. Maybe even the keeper of the Holy Hand Grenade and Neil Innes’ minstrel. Oh, and there should be a larger scale Trojan Rabbit. Next Next post: Is Captain Kirk a Republican?